Fellow geooddity afficionado and blogger Tom @ twelvemilecircle recently said it best when it comes to chasing down every single U.S. county. I’d have to say that, unless I become a multi-millionaire overnight, the dream of traversing every square inch (or at least every county) of the United States is a bit of a long shot for me as well. It’s been done before by a handful of people – including one Oscar Voss, who currently tops the mob-rule.com county counting leaderboard with a fully colored-in U.S. map and is well on his way to finishing up a Canadian map as well. I’ve recently taken up counting counties, with respect to – at least – my favorite states. I’ve easily finished up Delaware (only three counties) and have filled in my current home state of Maryland quite well, as well as neighboring Pennsylvania and Virginia (home to a whopping 134 counties and independent cities combined). I’d also like to fill-in the rest of Montana and Minnesota some day, and maybe some other states will beg to be completed (I’m one away on Connecticut, for example), but I harbor no expectations of getting to all of them. Right now I stand at 676 – an admirable total, for sure, but nowhere near the finish line. That’s 21.51% of U.S. counties, and I’m sure I didn’t appreciate many of them that I whizzed through. I made it a point to change that this last weekend as I drove up to Kent County, Maryland, the least-populated county (out of 24) in the entire state. Kent County is situated in a relative no-mans land (considering the eastern seaboard), just south of I-95 and north of U.S. 50, with no real reason to pass through it unintentionally. 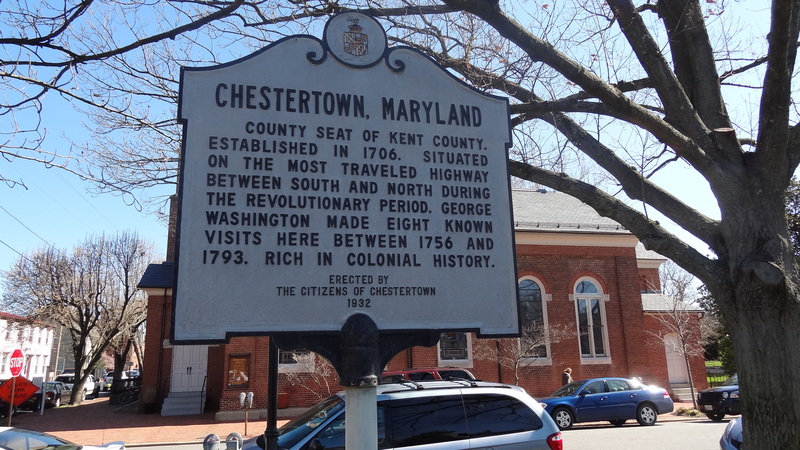 The county is spearheaded by Chestertown, the county seat, with all of about 5,200 people or so. The only other town in the county with more than 1,000 people is Rock Hall. I decided to visit both of them. Washington College sports teams (Shoremen and Shorewomen) are classified in the NCAA’s Division III. I was scheduled to meet up with family in Rehoboth Beach, Delaware at 2:30 p.m., so, waking up at 7:30 from the outskirts of D.C. didn’t give me too much time to explore – but it proved to be just enough to capture the flavor. 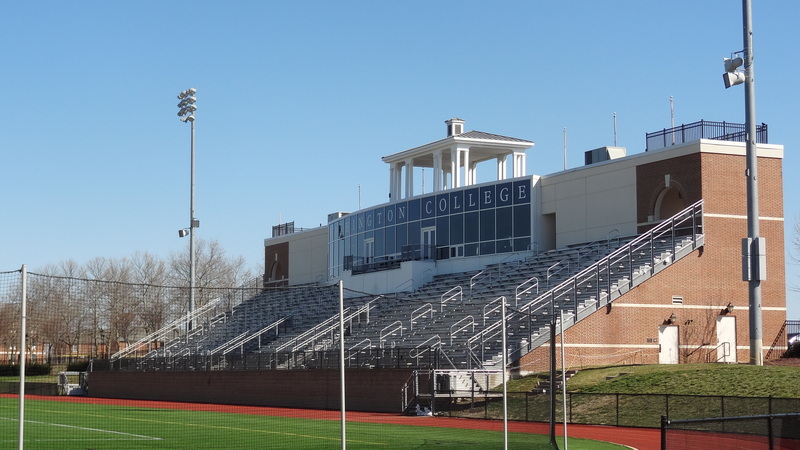 The slow 60-mile drive brought me to Chestertown by 10 a.m. and to the campus of Washington College. I don’t think many people are keen to the fact that Washington College is the 10th oldest institution of its kind in the county. I certainly wasn’t. The school, chartered in part with the pledge of George Washington himself, has been educating students in Chestertown since 1782. I would have spent more time on campus save for the fact that it was very chilly for an April morning and I didn’t have too much time to kill, so I took a couple photos, glanced at the baseball team practicing and soon made my way into town. The farmer’s market is small, but crowded. The town itself is situated on a hotbed of Revolutionary War history, claiming to be smack dab in of the busiest throughways of the time. 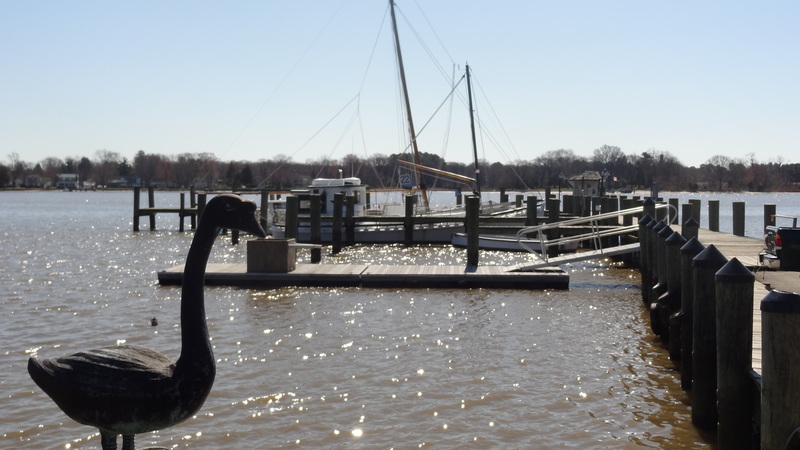 It was also a major port for the state – only trailing Chesapeake Bay champ Annapolis within the state of Maryland. 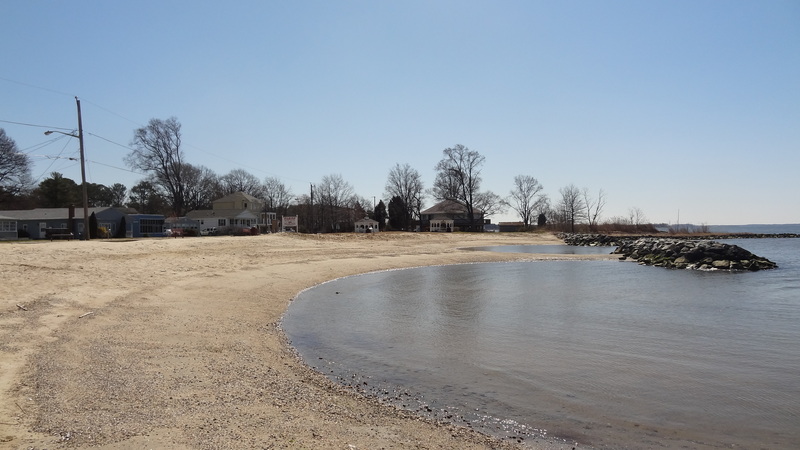 Its Chester River location was a prime spot 300 years ago as the new country began to take shape. 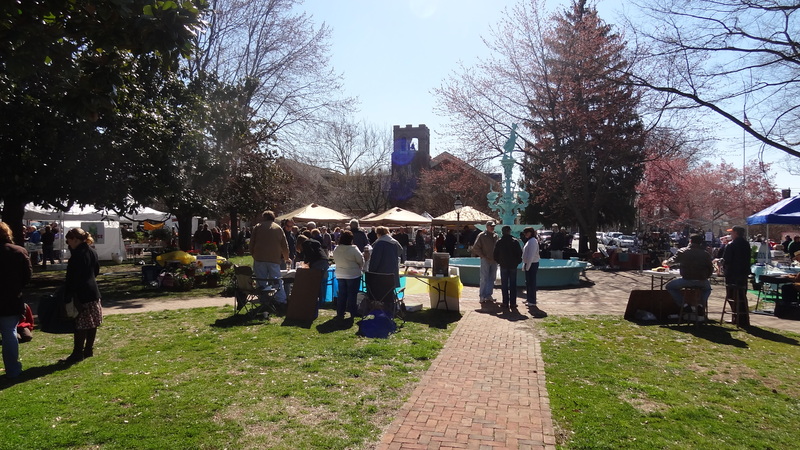 Chestertown was bustling with commerce this particular day as the local farmer’s market, a Saturday morning tradition, took hold in the town’s center square. Apparently the market is considered one of the best in the state (No. 1 in 2011 according to the town’s website) and, although I found it a tad on the small side, there were plenty of people and the pies (sold by the Lapp Family Bakery) are incredible. I took home an apple pie and it was worth all of the $11 I spent on it. 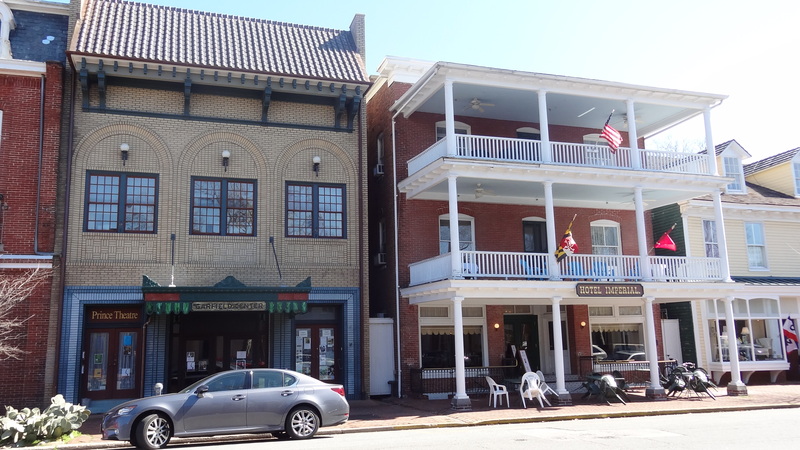 Instead of taking in an early lunch, I decided to extend my time in Kent County and drive over to Rock Hall, a small town right on the Chesapeake. 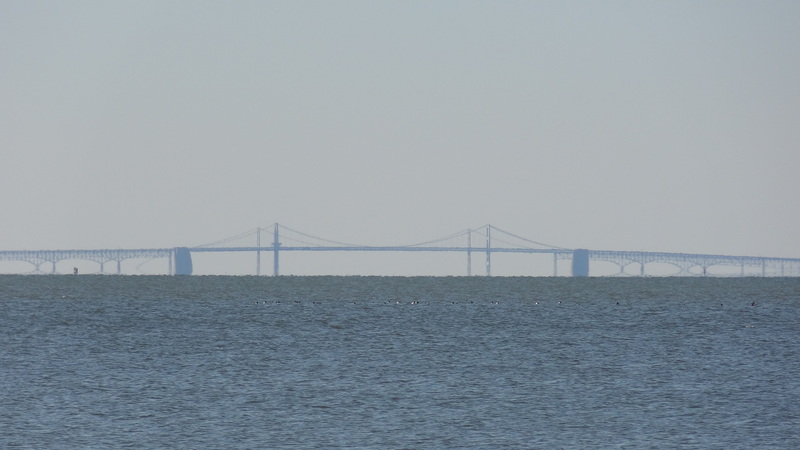 This isn’t your typical Chesapeake destination, but offers a rare view of the Bay Bridge from it’s humble little public beach (complete with a tiny boardwalk dotted with a few benches). Rock Hall is also home to the Waterman’s Crab House, which was recommended to me by a Chestertown resident. Though I didn’t have time for a seafood feast, it looked like a fine place to eat and get a great view of the bay. Note: That ups my total to 21 counties in Maryland, I’m (somehow) missing the southern counties of Charles, Calvert and St. Mary’s, despite being a fairly easy day trip away from checking off all three. Seriously, I’m almost ashamed of myself…I’ve been to the remote southwestern tip of Garrett County and not these three?